I've had a 1940s Voigtlander Bessa RF, a classic, rangefinder-coupled 6x9 folder, sitting on my desk for weeks awaiting some final fettling to sort out a rangefinder problem. Finally, I found some time to fix it, checked the focus with a ground glass across the film gate and was fairly confident that it was "on point", as my teenage daughter likes to say about her eyebrows. So time to try it out. This was another local auction find that nobody seemed to want so I got it for a good price. A year or so ago I won a 35mm "Barndoors" Voigtlander Vitessa at the same auction house. Like the 105mm f3.5 Skopar of the Bessa the Vitessa came with a wonderful 50mm f2 Ultron lens. Unfortunately, both cameras share a common fault - bloody awful viewfinders. They're so bad - small, dim and squinty tunnels - that they render the cameras practically unusable for someone who wears glasses. Even without glasses, they're still pretty hopeless. (Isn't it amazing how much I complain about rangefinder viewfinders? It happens so often you'd almost think the problem was with me rather than the viewfinders…) Voigtlander had a reputation for finding clever ways of solving camera problems so why it couldn't design a viewfinder that at least gives the photographer a sporting chance of getting a well-composed shot is beyond me. I loved the Ultron lens of the Vitessa - it took one of my favourite pics of last year - but disliked the viewfinder so much that I sold it on. The same fate awaits the Bessa now that I know it's working fine. 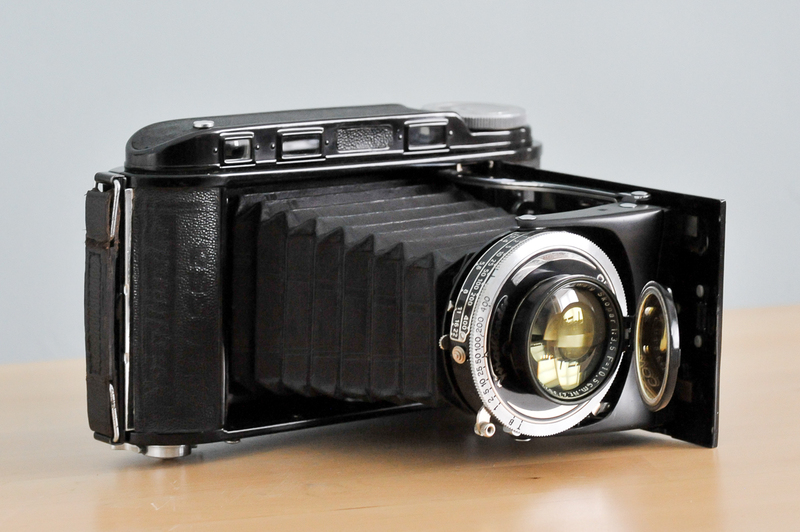 A coupled rangefinder folder with a good lens is a very useful camera, being capable of producing high quality images but with a very slimline form factor. Quite a handsome camera really. Note the swing out yellow filter - a great idea. The wheel on the left is for focusing. on top, switches a lightproof mask behind the windows once you've wound on. Although the Bessa will be departing the Robbins household at some point in the not too distant future, I have a back-up waiting in the wings - a folding understudy, so to speak. 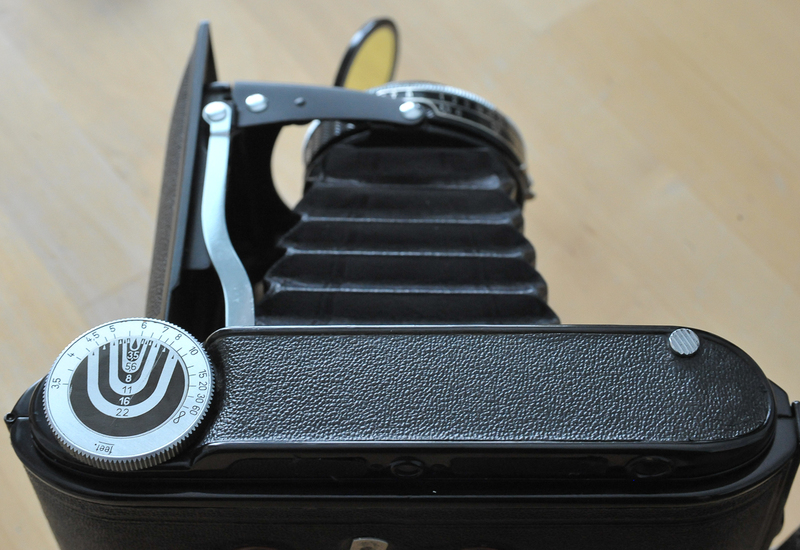 That's a 1950s Ensign Autorange 16-20, a coupled rangefinder 645 folder with an excellent 75mm Ross Xpres lens. But on this camera and despite having far fewer resources at their disposal than Voigtlander, Ross Ensign produced a cracking viewfinder with clear and bright suspended frame lines. It's a joy to use - apart from the fact that it's not usable yet. The Ensign's problem was a broken shutter for which I had to find a replacement part before dismantling part of it and then putting it all together again. It was quite a job, one of those fiddly affairs where tiny, fairy fingers would have come in handy. Having fat sausages sprouting from my palms, I found it a right carfuffle. Eventually, however, I completed the noisome task, gave the Xpres a clean and put it back together again. There was only a focusing ring to be replaced - when I realised I couldn't find the three tiny wee grub screws that held the ring in place. That was weeks ago and I still haven't found them. Haven't a bloody clue where they went, to be honest. I don't think I was stupid enough to actually knock them off my desk onto the carpet and suspect I stuck them to a piece of tape that has managed to find its way into a seldom encountered nook or cranny. Or perhaps I was stupid enough to knock them onto the floor - it's certainly not beyond me. Anyway, the resurrection of the Ensign is for another day. I'd just finished having a moan about the Voigtlander's viewfinder which leads me neatly on to the photo at the top of this post. It's a shot of the stairs in my house which I thought looked quite appealing in the morning sunshine the other day. It was handheld at something like 1/25th of a second, slower than I would have liked but setting the tripod up on the stairs would have been a right pain. I like it but you've maybe noticed the composition isn't up to my usual peerless standards (ahem!). That's because the bloody awful viewfinder suffers from bloody awful parallax. Hence the rather large expanse of not-a-lot on the left hand side of the frame. I could have cropped it, of course, but then I'd have nothing to write about. Actually, the framing isn't too bad and I reckon I can just about get away with it. The film was Tmax 400 which I developed in the ever-reliable Firstcall Superfine, a vice-free brew that does what it says on the tin - or plastic bottle in this case. It was just a test film to see that the camera was functioning properly, bellows were light-tight, etc. I took a few comparison shots alongside the 50mm Summicron on the Leica M2 for no other reason than to use up the last few frames on the 35mm roll. I'll try to write it up this week. So that's the Voigtlander Bessa RF - a classy camera with a very nice lens and a viewfinder that makes as much sense as steering a car with your feet. Another case of so near, yet so far. I'm counting on the Ensign to make amends for the failures of it's German cousins and deliver unto me a folding tool fit for the task of taking a good photograph. Good thing I wear glasses with actual glass in the lenses, not plastic, as I tend to crush the spectacles and the viewfinder into the eye socket to frame my pictures on some cameras. 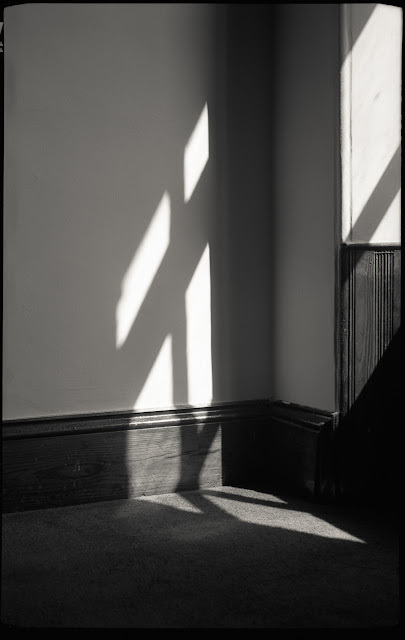 The convenience of large format with ground glass is not to be under estimated. The 105mm Skopar is a good lens. It makes lovely photographs, especially with ILFORD Pan F Plus and on a tripod. They must have been highly prized when they were new. Today they seem to command quite high prices, which is probably because their owners are (usually) reluctant to part with them. Certainly I wouldn't part with mine. What could replace it? Very nice shot. Such smooth tones. Such shadow detail. Obviously a camera that's made for you. I couldn't find a better crop. Removing the ostensibly blank left hand edge just makes it more literal and less mysterious. Well then, if you press me, perhaps a teeny-teeny crop off the top to lose the small dark triangle in the extreme top right. When repairing cameras, get something like a Really Useful A4 storage box. Use the inverted lid as a workbench, so that the rim prevents small objects rolling off and then store everything in the box until finished. You can stack several projects this way and keep the tools in another box. A couple of smaller boxes will hold tiny springs inside the larger one, or you might use film canisters, of course. Rod, you're right re the 645 finder mask! It makes the 6x9 finder look good. Overall, though, I'd much rather use the Ensign Autorange - very good lens, great finder and 16 big negs. Just need to find some grub screws to get it operational. These are nice cameras. I quite like using mine but I badly need to clean the viewfinder because it looks like some kind of bug has died in there which makes focussing very difficult. 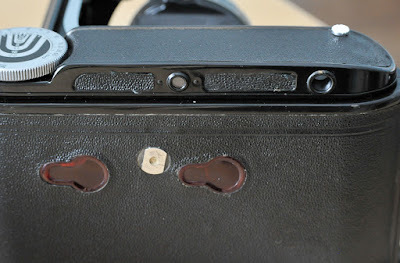 Do you have any links to help/info for dismantling and cleaning the viewfinder, please? 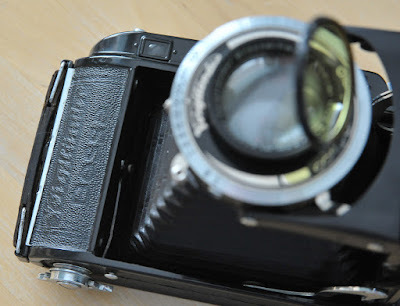 I have a Voigtlander Bessa I which is similar, but without the rangefinder. 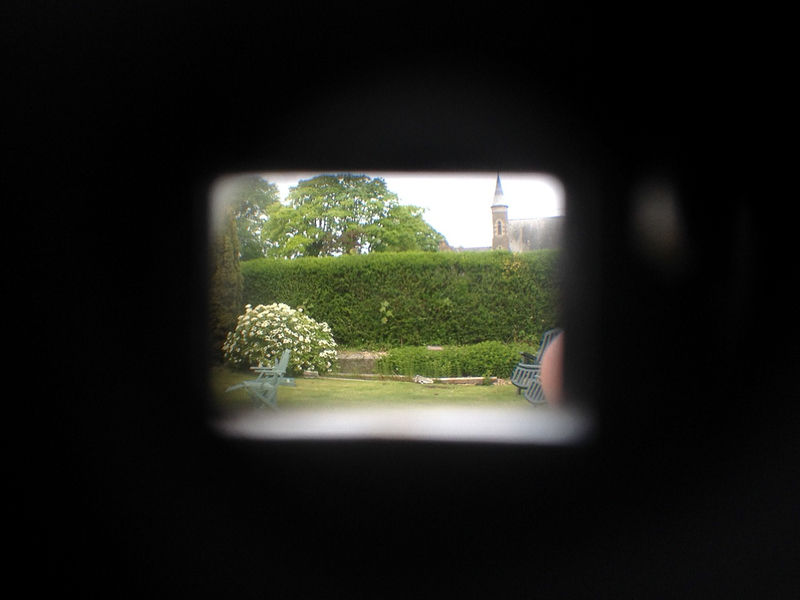 The viewfinder is similarly bad, and my nose gets crushed when attempting a landscape composition. Portrait compositions are a bit less problematic. The problem also affects other folders I own, and I'm tempted to buy a separate viewfinder such as the Kontur, but it would have to be a lot cheaper than the recent sales on the big auction site. Good luck with the Ensign. I have an AutoRange 220 and the glass is beautiful as well as the viewfinder being a pleasant experience - even with glasses. Unfortunately, it has a mysterious light leak that I haven't been able to find yet even after sending it out for a CLA. Squinty little viewfinders have become a real PITA to me now that I've amply scratched the plastic lenses of my glasses just trying to use them. Regarding framing, I had a similar problem with my Moskva 5 (6X9) using the 6X6 mask... Very approximative! Does anyone know why these viewfinders persisted and why people put up with them for so long? 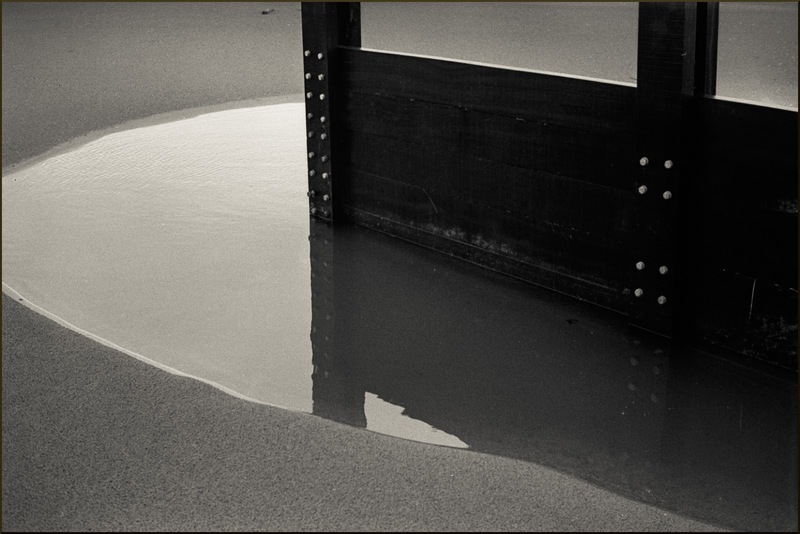 Early Leicas were just as bad – two dim squinty holes, one to focus and one to frame. These were very expensive purchases in terms of the weekly wage. Cheaper cameras had those little reflex finders. And yet serious photographers would have known the beautiful clarity and precision of a view camera ground glass and there were "sports finders" with an eyepiece and a wire frame for better framing. The MPP version had parallax correction. Even Hasselblad made one. Were they obsessed with reducing the size of the camera? Did they imagine that the only thing that photographers needed was to centre a defined subject in the frame? Did the inadequacy of these viewfinders contribute to the rise of the SLR? I'm asking because someone out there may know more about the history of camera design than the rest of us. It's not difficult but be careful when lifting the top leather covering on the right hand side. It will be quite fragile. Same goes for lifting the depth of field disc on the left as it's just thin aluminium. Good luck! Thanks very much, Bruce. Which kind of glue did you use to fix the top leather cover back and also the DOF disc? Thanks. I used a fabric glue from a craft shop. Had some handy from an earlier job of replacing velvet ribbon light traps on some old Rolleiflex plate holders. What kind of film would you recommend for the Bessa 1? That's a hard one to answer, Sidney, without more information. Black and white or colour, handheld or on a tripod, bright sun or low light, etc. The rangefinders, in my opinion, are more trouble than they are worth. One, barely noticed knock, and it gives errors. I much prefer the simple pop up finders on the top of 1920s - 1930s Zeiss Ikon Ikontas. It’s not difficult to set a distance, viz, a Rover 75 is 15 feet long, so, you position your portrait subject at that distance and your shot is spot on. For landscapes, just back off from infinity slightly. Stopping the lens well down always helps in covering up focus errors.